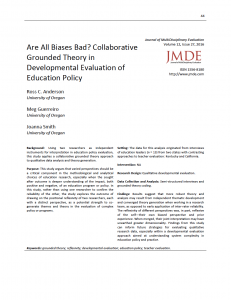 Using two researchers as independent instruments for interpretation in education policy evaluation, this study applies a collaborative grounded theory approach to qualitative data analysis and theory generation. The data for this analysis originated from interviews of education leaders (n = 13) from two states with contrasting approaches to teacher evaluation: Kentucky and California. Semi-structured interviews and grounded theory coding. Results suggest that more robust theory and analysis may result from independent thematic development and converged theory generation when working in a research team, as opposed to early application of inter-rater reliability. The reflexivity of different perspectives was, in part, reflexive of the self—their own biased perspective and prior experience. When merged, their joint interpretation may have unearthed greater dimensionality. Findings from this study can inform future strategies for evaluating qualitative research data, especially within a developmental evaluation approach aimed at understanding system complexity in education policy and practice.